Your child will learn to love the water and be safe at The Connection! We have an aquatics program for every age and ability, and our small student to instructor ratio ensures a high quality experience in our beautiful 5 lane, 25 yard pool. *Age limits are general guidelines. Please read the class descriptions to find the most appropriate class based on your child’s skills. If you are unable to determine the most appropriate class, contact the aquatics department for an assessment. Providing children and their caregivers the opportunity to learn how to be safe and relaxed in the water. 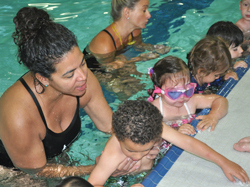 Classes teach basic swim skills that can be practiced, and prepare your child for an independent preschool class. Infants and toddlers must wear two diapers: a non-disposable swim diaper with gathered legs and waist (available at the Front Desk) over a disposable swim diaper. Water play aimed to acclimate infants to the water with their parents. Parents will be introduced to holding techniques and how to help their infants adjust to the water, while infants will be exposed to safely entering a pool, floating, and blowing bubbles. For infants beginning to become comfortable in the water with the assistance of a parent/guardian. 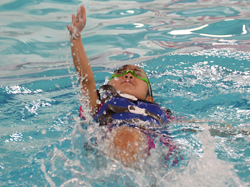 Students will gain confidence by learning to safely enter and exit a pool, submerge face with bubbles, roll from front to back, and use correct arm and leg movements. For toddlers comfortable in the water and ready to learn basic skills. Students with prepare for independent lessons by learning head bobs, independent floats, glides, submerging for objects, and jumping into the pool. Your child will be taught in a small group without a parent. All classes are 30 minutes long unless otherwise specified and your child must be 3 years old by the first class (must be toilet trained – no pull-ups please!) Learning basic strokes is just the beginning in our progressive program where your child can advance according to his/her ability. 45 minutes of gym time including obstacle course, movement and coordination skill activities, and instruction on all apparatus. Plus 30 minutes of a fun, safe, and instructive pool time practicing skills including floating, arm/leg action on fronts/back, jumping, and more! Timid first time swimmers will gain confidence in the water through personal water safety skills including: entering and exiting the water, proper body positions, and basic movement. Swimmers who enjoy the water but still need assistance will explore breath control, floating, gliding and arm/leg movements with their teacher. Confident swimmers who are beginning to achieve independent skills will use arm/leg actions to increase their abilities and use breath control to swim further distances. Independent swimmers learn to effectively coordinate their movements, increase distance and practice rhythmic breathing to lay the foundation for future strokes. Whether your child is learning basic strokes or preparing for a competitive swim team, Our swim program encourages children to learn at their own pace and advance to the next level accordingly. Our certified instructors will encourage your child to achieve his or her best in the pool. Swimmers who are comfortable in the water, but not yet able to swim distances independently, will learn to effectively use arm/leg movements, glide, and float to further develop their abilities. Independent swimmers who can effectively coordinate their arm/leg action will lay the foundation for future strokes including: freestyle, backstroke, and breaststroke. Students should be comfortable in deep water and able to swim 15 yards. Confident swimmers will perfect technique in freestyle, backstroke, and breaststroke while increasing their distance and stamina. Students should be comfortable using the diving block and swimming 25 yards without equipment. Level 4 through T.O.P.S. introduces students to the world of competitive swimming. In addition to perfecting strokes, our competitive levels will focus on diving, starts, turns, sharpening technique, timing and swim etiquette. Swimmers will also learn to use competitive equipment such as pull buoys, fins, hand paddles and the pace clock. Our teachers will use workouts, endurance training, and stroke drills to provide your swimmer with the skills needed to be successful on a swim team. Students should be comfortable swimming 50 yards of freestyle, backstroke, and breaststroke, and attempt 25 yards of butterfly without equipment. Students should be comfortable swimming 75 yards of freestyle, backstroke, and breaststroke, and 50 yards of butterfly. Students should be comfortable swimming 100 yards of freestyle, backstroke, breaststroke, and butterfly. Our Talented Opportunity Program for Swimmers is for students who have the potential to be on a swim team but may not feel confident enough or have the time to dedicate to a team. T.O.P.S will be offered multiple times a week with a minimum 2 day requirement. 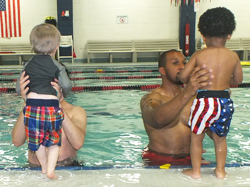 Our special needs swim lesson (SNSL) provides 45 minutes of instruction provided by our trained staff and volunteers. This program is designed to teach and improve each student’s swimming skills while working in a group environment to improve their focus, comfort, and overall understanding of safety in the pool. This one hour program provides individuals who are physically or intellectually challenged the opportunity to use the pool for exercise, learn basic swimming skills, be part of a social group, and play games while having fun in a safe aquatic environment. *Download the Medical form and return it to The Connection one week prior to participation in program. Trained swim instructors work with participants to help them reach their individual goals. Goals can range from giving a beginner confidence in the water to improving on an advanced swimmer competitive techniques. Semi-private lessons are also offered. Contact Jeff Porter at jeff.porter@theconnectiononline.org for availability. Enjoy family time swimming in the pool. Parents must accompany children in the pool. Children without a parent must be at least 10 years of age – noodles, balls and toys available. Infants and toddlers must wear two swim diapers: a non-disposable swim diaper with gathered legs and waist (available at Front Desk) over a disposable swim diaper. Free for Total Facility members or $20 family pass for non-members available at the Front Desk. Bring your kids, Infants- 6yrs, to enjoy 1 hour of play time in the pool. All children must be accompanied in the water by an adult. Have fun with toys, balls, music and more! $7.00 daily pass per child available at the Front Desk.